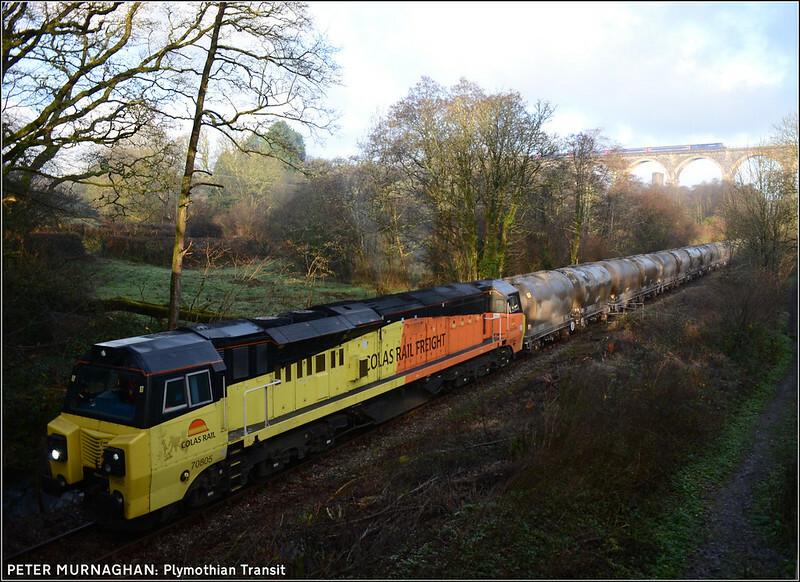 One prediction that I would not have ventured over the last 2 years was that we would ever see the return of freight trains to Moorswater, after their 'last run' in 2013. However, as we learn from the (excellent) Cornwall Railway Society's website, a regular weekly train has commenced bringing 22 cement wagons from Aberthaw to Moorswater on Wednesdays. returning on Thursday mornings. Most unusually, the loco remains overnight locked in a Moorswater depot. I understand that the next working is scheduled for 11th January. If you wish to illustrate this working, I have a pic, taken on its most recent run, 22nd December. Here is the train, headed by 70805 with the Moorswater empties pulling forward to the start of the Token section at Coombe, with the 0741 Penzance HST crossing the viaduct in the background. Hope you like it. - yeah, its not bad! Thanks Peter for the excellent picture, and keeping us up to date with events in that area.